All weather professional grade splicing tape used as primary insulation up to 600V and as a protective outer jacket up to 69KV. - 8.5 Mil Thick for Heavy Duty and High Voltage Applications. - Comparable To 3M Super 88. - Use as Primary Insulation up to 600V. - Use as Protective Outer Jacket up to 69KV. - Excellent Cold Weather Resistant Properties. - Flame Retardant and Weather Resistant. - Highly Elastic Polymeric Backing - Excellent Elongation. - High dielectric strength, high adhesion and shear. - Resistant to acids, alkalis, chemicals, oils, moisture and corrosion. 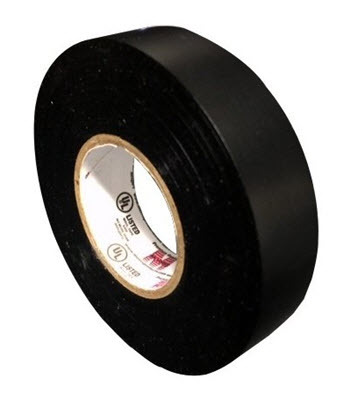 - Electric tape withstands 10,000V. - UL 510 and CSA 22.2 Listed. - ASTM-D-3005 and HH-I-595C Approved.